How to prepare for an estimate? Design and/or estimate process for landscaping, deck or roof structures, is always the most exciting part! During our meeting, we will talk about your lifestyle, wants and needs. Ahead of our initial meeting, it is advised that you think about the spaces you would like to create, the use of your backyard space and the design style you like. A picture is worth a thousand words so, if you see something you like, we encourage you to bring it along! How does a deck and landscape estimate work? There are two ways that an estimate can be done for landscaping: either the customer already has a design (i.e. done by a design firm) and we provide the cost for work, or we can provide a quote for both the design and work to be done. Working with a finished design, is a much quicker process and usually we can provide a quote on a project within 1-2 weeks, depending on the complexity of a project. Estimates are free of charge. When we get hired to do a design as well as a quote, it is a much longer process. The design and quote process is outlined on our Landscape Design Services page. The timeline depends on the complexity of the design and the amount of back and forth communication with a customer. Why is it important to check zoning information? Zoning information is one of the most important aspects when creating a design. Zoning will give us restrictions on the size of structures, coverages and setbacks from property lines. Zoning is specific to the city and zone you live in. You must remember, each zone will have different requirements. Therefore, it is best to check with your local zoning department ahead of our initial meeting. What happens if I don’t get a permit? If building starts without a permit, an inspector can stop work effective immediately, until all necessary permits have been obtained. Assuming the design complies with all zoning restrictions, permits can be obtained, and work can be resumed. If the design does not comply with zoning requirements, the project must be either, redesigned and rebuilt to comply or it has to go through a process with the Committee of Adjustment, which does not have a guaranteed outcome and is a lengthy process. It is always best to apply for a permit before work starts. If a project is finished without a permit, there could be issues with your insurance company if something were to happen, or during the sale of a house. Why is it important to follow Toronto softscaping requirements? The City of Toronto has one of the strictest zoning requirements regarding the amount of mandatory greenspace in the back/front yard. This condition does not affect a permit requested for a deck, roof, pool or any other structure. If landscaping is the only work being done, then no permits are required; however, compliance with softscaping coverages are required. This is to provide enough softscaping for rain water to get absorbed into the ground and to minimize the amount of flooding Toronto has been having, along with other benefits associated with more greenery. Royal Decks and Landscapes specializes in modern and contemporary designs. Our goal is always to make the best out of your home. Make your next vacation happen in your own backyard. Designing outdoor living and growing spaces is truly art in nature. Over the past decade, the landscaping industry has grown leaps and Decks is always on top of the latest techniques, trends and technologies to help you grow. Our 13 years of experience gives us the edge to make your front or backyard both functional and beautiful. One of our biggest goals in company is complete customer satisfaction. One way this is achieved is through constant communication throughout the entire design and construction process. It is in recognizing the details of innovative design, fine woodworking and landscaping that sets us apart. ROYAL Decks Co. is a custom decking company priding itself in high quality of work and complete customer satisfaction. ROYAL Decks Co. focuses on specialty materials, such as exotic hardwoods, low maintenance materials and high grades of cedar. 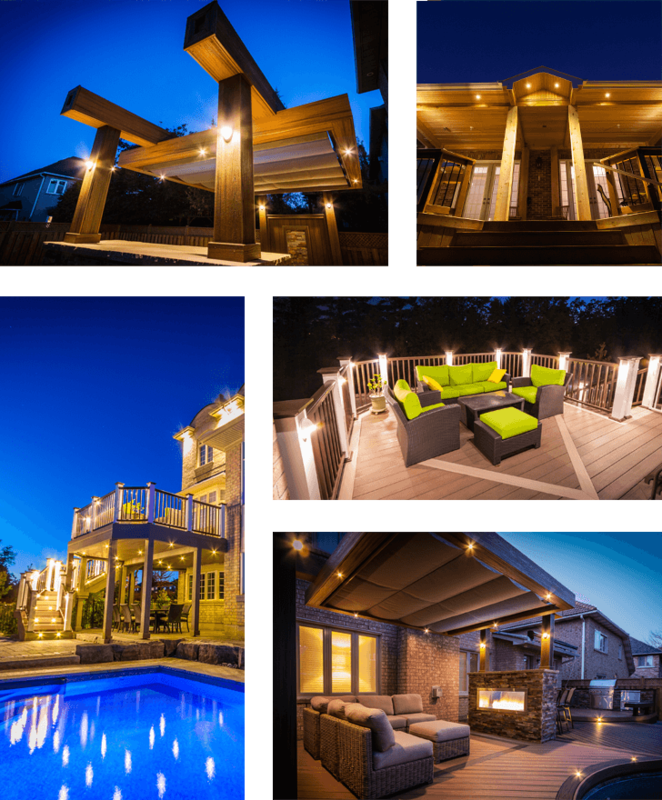 ROYAL Decks Co. offers a complete solution for a homeowner from custom designs to the execution of the project. 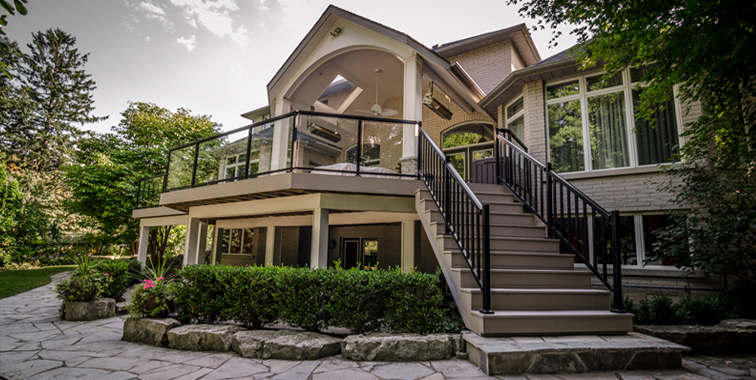 ROYAL Decks Co. was founded in Burlington Ontario and quickly grew to serve all surrounding areas of Toronto and from 2008 also Calgary. We are successful because we take every project as if it was the only one, although we build hundreds each year. In order for the deck to be great, it has to be usable, look great and fulfill all of the customer's expectations. With our extensive experience, we will work with you to design the deck that will serve the purpose, according to your needs. This means getting the right size and shape of the deck, getting the right features and selecting the right materials. We work with many materials of different properties and we are sure to find one that will work for you. We have only the most experienced carpenters. Our carpenters have been in construction most of their lives and they build decks not because they have to, but because they love it. All of our decks have to meet very strict ROYAL Decks Co. quality control on top of any building code requirements. 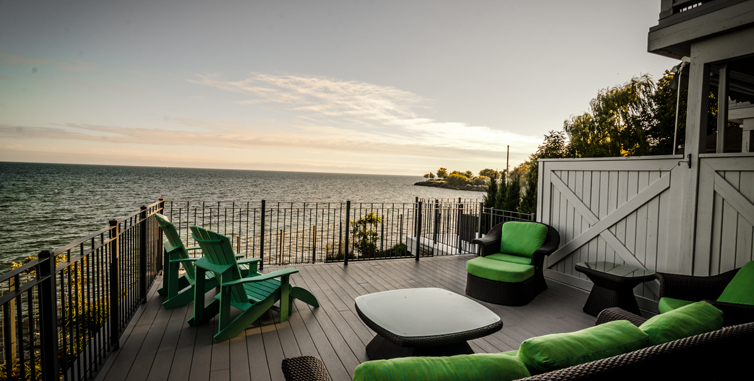 Our decks not only meet building code, they exceed it. Our estimate includes time frame when the project will be started, how long it will take and how much exactly it will cost. We strive to make the construction process an enjoyable experience. That is why we take these extra seriously. We are proud to give one of the best warranties in the business to every deck that carries ROYAL Decks Co. name on it. We stand behind the work that we do. To see details about our warranty please visit our warranty website. Safety is our utter most requirement doing any work. We carry both WCB and WSIB, to date without a single claim. We keep our workplace neat and organized to minimize any injuries.